Looking for a new car (or used) is not always a simple thing. And it can get downright complicated if you’re not sure how to narrow down the choices. Among those complications is the simple fact that there are more than 260 current-year vehicle models from which to choose in the United States – a daunting number, indeed. And then there are a lot of potential sources from which to obtain useful news and information in print and online. And no shortage of automotive experts who are willing to give you advice on how to do your new car shopping. 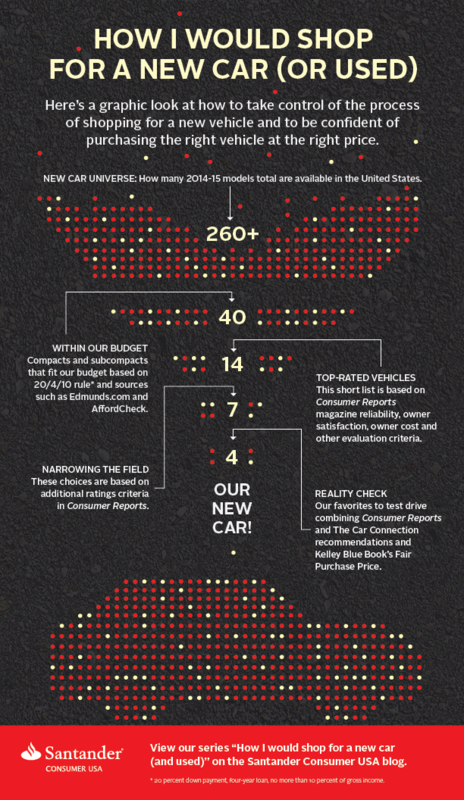 Our infographic (below) provides a quick study – a cheat sheet, if you will – of one way to narrow the choices to a more manageable list, and then to identify the vehicle that best meets your needs. For the details, though, you’re going to have to read the series – “How I would shop for a new car (or used) in five easy steps” – based on the process I used recently in looking for a new vehicle.